Review: In 1973 women’s professional tennis was simply not getting much respect, especially from the tennis professionals on the men’s tour. If anyone doubted that fact, the ladies on the tour would point out that the prize money for their tournaments were often 1/8 of what the men could earn for winning. Morale could not be lower among the women on the tour trying to make a living. To save money they had to drive in their personal cars to the tournaments, and share rooms with other players. To add insult to injury, 55 year old Bobby Riggs (Steve Carell) publicly announced that he could beat any woman in the world, and was eager to prove it. Of course, prize money had to be involved. Margaret Court (Jessica McNamee), the Australian woman who was ranked #1 in the world at the time, accepted Riggs’ challenge. In a much ballyhooed match, Riggs whipped Court 6-2, 6-1, much to the delight of chauvinists such as former professional tennis star Jack Kramer (Bill Pullman). 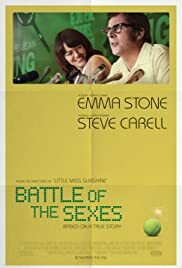 This loss was a severe blow to the fledgling new women’s Virginia Slims tour, and forced #2 ranked Billie Jean King (Emma Stone) to pick up the gauntlet thrown by Riggs, thus setting up the match forever known as The Battle Of The Sexes. The match took place on September 20, 1973, and was watched by 50 million Americans, the most ever for a television event in history for many years. The repercussions as a result of the match were dramatic, and changed sports and culture in this country. This is an excellent film with a compelling story. It is always tricky to do a movie about real events and people, and maintain a degree of accuracy and hold the interest of the viewers. It helped to have great actors like Carell and Stone who actually looked a lot like their real life counterparts, and for the tennis scenes to be believable. The movie was also rich in background, as we were able to see much of the man behind the Riggs extroverted showman persona as he dealt with his need to compete and be a factor 20 years after his professional tennis career was over. Billie Jean had her own personal battles to deal with, from her sexuality to her drive to be the champion of equal rights for women. There’s a lot going on in this movie, and all story lines converge in the Houston Astrodome in 1973. Tennis Play – For viewers who know something about tennis, the scenes where Riggs and King are playing look authentic. Both Carell and Stone were given extensive lessons to become competent in the close-ups, but the clever editing allowed former top professional Vince “I ain’t afraid of ya” Spadea to play Riggs in the distant shots, and current pro Kaitlyn Christian filled in for King’s shots. And yes, the film got the rackets right. Bobby Riggs played with a metal Head racket, while Billie Jean had her trusty wooden Wilson racket.